The first meeting of the Period Furniture Group will be held at Woodcraft in Newington on Saturday, September 22, from 9 am to noon. Our project this year will be a Federal Knife Box. Ownership of silverware in colonial homes was a statement of stature and wealth and deserved a fine, secure but visible storage box. If you don’t have your mother’s sterling flatware, you can just make this box with any interior storage you desire. You will learn a number of techniques, including veneering and how to make the banding and inlay adornments including sand shading. This small project is certainly not small in developing your woodworking skill set. It is not expensive to build, and you have choices of individual design, decoration and hardware. After all it is your project we are there to help. The model for our build has graciously been provided by Steve Lash. Steve is a founding member of the Society of American Period Furniture Makers and winner of their Cartouche Award. Steve made a matched set of these with rave reviews. Although small in size it is not small in skill set development for the woodworker. This knife box/silverware box was not commonplace in colonial homes. 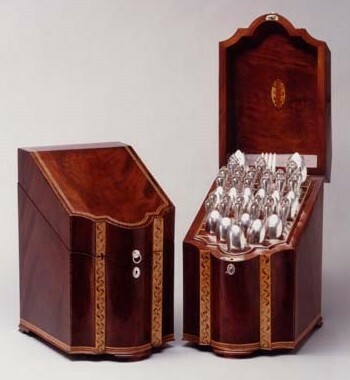 Ownership of the silverware was a statement of stature and wealth and deserved a fine, secure but visible storage box. We recognize the questionable usefulness of such an item in today’s homes. This project is certainly not a large expense for build along builders because we are going to explore the banding and inlay adornments heavily and you will make them yourselves. This includes sand shading. The greatest expense will be in hardware and here you have flexibility in your price range. After all it is your project we are there to help. The model for our build has graciously been provided by Steve Lash. Steve is a cartouche winner and founding member of ASPFM. Steve made a matched set of these with rave reviews.